because it has to do with pink and orange. I used all the concepts for this card and to check the concepts out, you can click HERE. I am happy that I used my scraps for this card too!! It's always good to go green :) Come join us and remember to check out the other cards created by the DTs! I have a surprise for my Penang babe that I created yesterday. I asked her for wedding photos and boy, she sent me a bunch this morning. They looked so beautiful together! I was glad that the photo matched my gift for her. The colors matched!! Phew! A lil info bout this sweet lady... She is a very friendly soul and she is such a special friend to me. We have upgraded our friendship from blogger friend to now "friends". Haha. This girl can chat and chat, well simply because I am chatty too! LOL!! She does beautiful cards...seriously!! I love her clean look and her choice of colors + she has tons of stamps!! You should check her out HERE. Cindy, this is made especially for you! A token of our friendship :) Hope you like it! Love the blooms? My bestie, Wati Basri is selling them over at her garage for a very reasonable price. She RAKed me some so I decided to take this opportunity to use the blooms to make a gift for Cindy & also to shout-out about these beautiful blooms. So hurry to Wati's garage now before it is all gone!! Hurry, hurry click HERE to get more info! Thanks for dropping by again and do come back for something FUN & BIG tomorrow :) I am excited!! P/s: BTW, are you ladies experiencing prob with moderating comments? I see it at the dashboard but when I wanna publish it, nothing appear. Weird eh? wow... wow... first... I so in love with the gift you made for Cindy... (Lucky she! 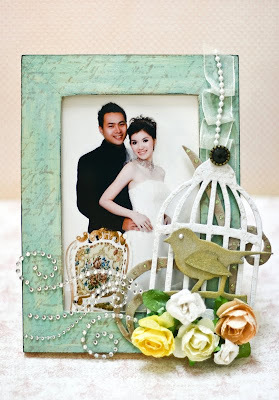 )so sweet ..the picture and the embellishments everything compliment each other... love the cage and blink... of course Wati's bloom....match!!! Beautiful works again! I wonder what you've got in mind for tomorrow :)... I'll be back! OH MY GOSH!!! I really don't know what to say!! It's so gorgeous and I'm really surprised that you made this for me! It's PRICELESS!! Thank You so much babe!!! I'm giving you a bIG HUG all the way from Penang!!! MUACKS!! Love that card, something I can totally use, thanks for the idea! 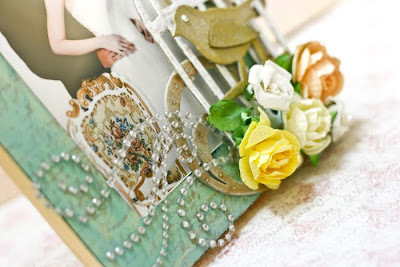 Adorable adorable frame alteration job, so very beautiful! I am sure Cindy love this... its awesome.. look at the beautiful couple. Your birdcage is delish.. and the flowers are awesome..
that frame is awesome...it's so, so gorgeous. i'm sure that your friend cindy will love it!! Beautiful work, Jessy! I ♥ the embossing & all the texture on that card! So cute! I saw this over on Cindy's blog and just wanted to tell you how pretty it is. What a lovely gift. Those flowers by Wati are gorgeous, too. Love your card, too - pink and orange is my favorite summer combo! Your card & photo frame are just amazing...! You always make me go 'wow, I din know you could use it that way' ;) Very inspirational! Sure cindy will LOVE that gift Jessy. It is soooooooooooo pretty. And the card is lovely too. Woo Hoo on using up the scraps for sure. Green is good LOL! lucky bride the frame is gorgeous :) :) ! how sweet is that !